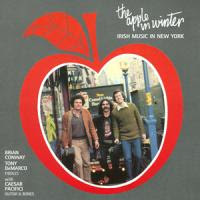 The Apple In Winter: Irish Music in New York. One of the great lost albums of New York's musical heritage, recorded 25 years ago on Green Linnet Records. Tony DeMarco (the man in the middle) in 1981. 11th Street Bar, January 2008. Tony Demarco looks like he could be an associate of the Gambino family, though his line of work is legitimately more lucrative; he is a commodities trader on the New York Board of Trade. Tony DeMarco is New York Irish though his last name belies his heritage. He grew up in Brooklyn with an Italian father and Irish mother. Italians and Irish intermarry for generations. Their shared Catholic religion lubricates the relations. And the Italian women are eager to sign-off their multi-syllable surnames for names like Flynn, as my cousin Diane exchanges for Vigliotti. I run into Tony a few times around town, always below 14th Street. Last I see him is at NYU’s Glucksman Ireland House for a Brendan Mulvihill concert.